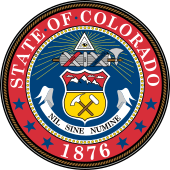 The Colorado House of Representatives is the lower house of the Colorado General Assembly, the state legislature of the U.S. state of Colorado. The House is composed of 65 members from an equal amount of constituent districts, with each district having 75,000 people. Representatives are elected to two-year terms, and are limited to four consecutive terms in office but can run again after a two-year respite. The Colorado House of Representatives convenes at the State Capitol building in Denver. ^ "Colorado House Committees". Open States. Sunlight Foundation. April 9, 2014. Retrieved April 9, 2014. ^ "Legislators". Colorado General Assembly. Retrieved January 8, 2019. This page was last edited on 23 March 2019, at 08:59 (UTC).